Founded by the Poor Servants of the Mother of God (S.M.G) Sisters the school opened in 1939 as a boarding school for girls who wanted to continue their education into secondary level. Back then the boarding school operated 7 days a week and you went home at Christmas and Easter only! The school continued to offer boarding until the late 1980’s when it ceased boarding and became exclusively day tuition. In 2009, the school joined the umbrella of the Le Chéile Schools Trust which brings together similar schools offering a Catholic based education. 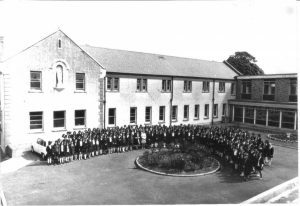 Today St. Aloysius’ College is a voluntary post primary school, it continues its long tradition of providing an education centred around Catholic values for girls between the ages of 12 and 19 but is also open and welcoming to students of all faiths and creeds. Our present enrolment is 779 students. Our everyday work is inspired and motivated by our Mission Statement.